David Cleveland, a renowned film archivist, author and founder of the East Anglian Film Archive. Chris Squires, a film-to-digital transfer specialist who uses the Memory HD Telecine system. Michael Woodley, a successful web entrepreneur and CTO of Doovle, an in-video search technology that is currently being explored as a movie search engine and digital film archive platform. This is a free event! Don’t miss this opportunity to discuss, share knowledge, opinion and facilitate a discourse on how analogue film, through its preservation and continued practice as a moving-image medium, can remain a rich source of cultural heritage in our digital epoch. 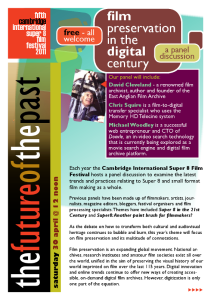 Each year the Cambridge International Super 8 Film Festival hosts a panel discussion to examine the latest trends and practices relating to Super 8 and small format film making as a whole. Previous panels have been made up of filmmakers, artists, journalists, magazine editors, bloggers, festival organisers and film processing specialists. Themes have included Super 8 in the 21st Century and Super8: Another paint brush for filmmakers? As the debate on how to transform both cultural and audiovisual heritage continues to bubble and burn, this year’s theme will focus on film preservation and its multitude of connotations. research institutes and amateur film societies exist all over the world, unified in the aim of preserving the visual history of our world imprinted on film over the last 115 years. Digital innovation and online trends continue to offer new ways of creating accessible, on-demand digital film archives. However, digitization is only one part of the equation. The filmic experience is a unique one. A fundamentally important aspect of film preservation lies in the collective experience of screening the medium in its original form. Film, as a time-based medium, is imbued with such referents as memory, nostalgia and storytelling. Preserving film also requires the restoration and storage of the physical medium itself, which is fragile and prone to decay, along with the equipment required to screen it. Combining these aspects raises some wider questions. For example, how long will film as a physical medium last? Can digital replicate the qualities inherent in analogue film? In the case of Super 8, its visual aesthetics have migrated into the digital domain in the form of video editing filters and effects. Now there is even an iPhone app* which gives digital video that Super 8 look and feel. of a commercially dying format to a new generation, as well as a production tool for filmmakers seeking an authentic, vintage look.